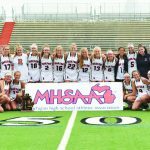 The Rockford Girls Lacrosse team had a busy week first playing in Chicago over the weekend and then hosted East Grand Rapids on Monday, April 23rd, traveled to Caledonia on April 25th and then hosted a play day on Saturday April 28th. The Lady Rams are working hard offensively and defensively and working as a team. The kids are causing turnovers, getting the groundballs and controlling the draw. The Rams came out strong defeating East Grand Rapids on Monday, April 23rd 15-10. The girls played well both offensively and defensively. Our midfielders had control over the draw 15 times. Mac Vandermolen led the scoring with 7 goals and 6 draw controls, followed by Brooklyn Neuman who had 3 goals and 3 assists and 4 draw controls. Izzy Holmes had 4 assists, Sydney Zimmerman with 3 goals and 6 draw controls, Maggie Hammer had 1 goal and 1 assist, Katie Rodriguez had 3 assists and 1 draw control, and Maddie McCreery had a goal. The defense keeps the Rams in the games and includes, Bailey Banfield, Anna Glynn, Madi Kleefisch, Shae Strehl and Hannah Tompkins. The Rams defeated Caledonia 15-3 on April 25th. Izzy Holmes led the scoring for the Rams with 5 goals and 1 assist, Kerrington Vandermolen with 3 goals, Sydney Zimmerman with 3 assists, Mac Vandermolen with 1 goal and 2 assists, Brooklyn Neuman and Maggie Hammer with 2 goals each, Sarah Gilcrest with a goal and defender Shae Strehl with a goal. Great work ladies offensively and defensibly. The Lady Rams hosted a play day on Saturday, April 28th and played Cranbrook and Lyons Township. The Lady Rams beat a strong Cranbrook team 18-8. Brooklyn Neuman with 6 goals and 1 assist, Mac Vandermolen with 4 goals, Maggie Hammer with 2 goals, Katie Rodriguez, Maddie McCreery and Kerrington Vandermolen with 1 goal and 1 assist, Sydney Zimmerman with 2 assists, Chloe Dunham and McKenna Rinehart both had a goal, Izzy Holmes and Lilly Newman had an assist. 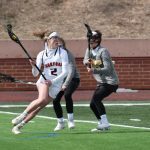 The defense Shae Strehl with a ground ball and 3 caused turnovers, Madi Kleefisch with 2 ground balls, Bailey Banfield and Anna Glynn both had ground balls. The week ended with a game against Lyons Township, a team from Illinois. The Lady Rams took charge early in the game and won 17-8. Mac Vandermolen came out with 5 goals and 1 assist, Brooklyn Neuman with 4 goals, Sydney Zimmerman with 1 goal and 4 assists, Katie Rodriguez with 2 goals and 2 assists, Kerrington Vandermolen with 2 goals and 1 assist. Izzy Holmes with 1 goal and 1 assist, Maggie Hammer Maddie McCreery, and McKenna Rinehart each had a goal. Lilly Newman also had an assist. Once again the defense held strong causing many turnovers and grabbing the ground balls. The defense consists of Bailey Banfield, Madi Kleefisch, Anna Glynn, Shae Strehl and Hannah Tompkins. The girls will play Catholic Central and Forest Hills United this week and look forward to continuing their winning streak.